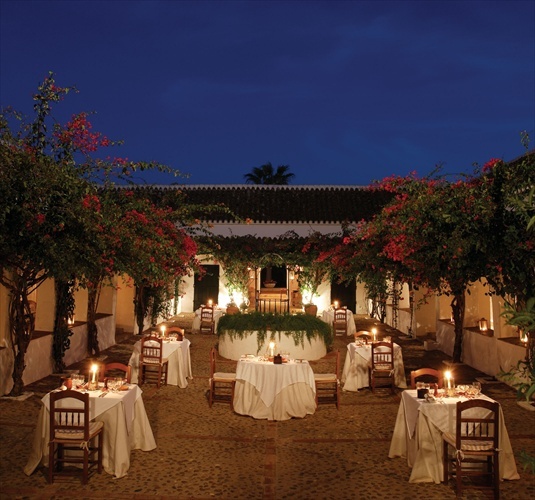 A recently-renovated haven of rustic chic, the 300-year old, 14-room Hacienda de San Rafael is 54 km south of Seville. Oriental antiques and artefacts blend with the Anglo Spanish owners\' art collection and family memorabilia. Round the cobbled central courtyard are 11 stylish duplex rooms with peaked ceilings and galleried bathrooms; three casitas share an infinity pool in a private garden. The whole Hacienda can be booked for private functions and weddings, with catering for up to 100 guests. Many guests visit regularly, drawn by the personal service and fresh, simple Mediterranean cuisine. Romantic, cultural, relaxing and country getaways for singles, couples and active adults. Exclusive use of the whole property for groups of max 28 guests. Fashion shows, photoshoots. In-house catering for up to 100 seated guests for birthdays, weddings and anniversaries. Individual menus on request for vegetarians and guests with choosy appetites. Well-organised excursions. Not ideal for guests looking for nightlife or wanting to be within walking distance to bars and restaurants or for guests who require in-room TV (the Hacienda has one TV, in the TV room). Staff speak Spanish, English and French. Boutique and gift shop open 10:00 to 20:00. Reading room. Art gallery. Daily news digest provided in client´s own language at breakfast. TV room. DVD library available at reception. Safety deposit box in reception. Laundry, dry cleaning and pressing service. Non-allergenic pillows and duvets available on request. Dressing-gowns provided for use of guests in casitas during their stay. Individual heating/air conditioning in all rooms. Hairdryers in all rooms. Babysitters on request. Open March-October. EXCLUSIVE USE of Hacienda for anniversaries, parties and weddings can include: 11 deluxe rooms and 3 casitas (in-house guest capacity 28), 5 acres of gardens and 3 outdoor swimming pools; flamenco entertainment; 3-course dinner for up to 100 seated guests with in-house catering and selection of menus; photographers, DJs and private transfers. SPECIAL HONEYMOON PACKAGE includes: Bottle of house champagne in room on arrival; hot air ballooning in the Sierras with champagne breakfast; riding safari along Costa de la Luz with picnic. Check-in 14:00; check-out 12:00 (please note that these times are flexible depending on availability). The Hacienda accepts payment in euros, Euro-cheque, travellers´ cheques in major currencies and major credit cards. The Hacienda does not accept or exchange foreign currency. In the event of a no-show or cancellation with less than 7 days\' notice given prior to the date of arrival, the amount equivalent to 100% of the total booking value will be charged. CONTINENTAL BREAKFAST 08:00-12:00, included in room rate. Served on the veranda outside your room or in the thatch-roofed, private sitting-out area by your casita. LUNCH à la carte 13:00-15:00, 25 euros p.p. 3-COURSE DINNER 20:00-23:00, 55 euros p.p. The chef's outstanding selection of recipes focusses on Mediterranean cuisine and local produce in season. Alfresco service whenever possible. Delicious and inventive vegetarian and children's dishes on request. Orders for BAR SERVICE and ROOM SERVICE are made directly with the staff. Boardroom or theatre style meetings for 10 attendees in spacious 8x6 metre meeting room. 7 metre ceiling offers abundant natural light. Free high-speed wireless internet connection. Email and fax service, integrated audio visual equipment available. In-house catering for business lunches. Paddle tennis. 3 swimming pools. 5 acres of well-maintained gardens. Reading room. TV and DVD room. Art collection. Horse riding at family-owned stables a short drive away offers accompanied rides out along the coast, in the woods and along the pilgrims' route. Golf at the Montecastillo, Dehesa, Montenmedio, Benalup, Real Sevilla or Zaudin golf clubs. Sailing in the Bay of Cádiz. Hot air ballooning. Hiking and birdwatching. Canyoning, spelunking, bungee jumping, rock climbing, paintballing, quad biking, kayaking, paragliding. Partridge or clay pigeon shooting 15th Oct-15th March in varied locations; game fishing in the Atlantic. Spa and facial treatments, manicures, pedicures and epilation. Thai massage, aromatherapy, Reiki, foot reflexology, Indian head massage and yoga. By appointment. Please smoke in the open air. Guests are requested not to smoke indoors in the rooms and public areas. Daytime: leisure wear. Evening: casual chic. The Hacienda is a sophisticated rustic hideaway in a former olive plantation surrounded by open country. It lies halfway between Seville and Jerez, west of the Grazalema mountains and east of Doñana National Park. The Hacienda de San Rafael is 5.4 km from the motorway. Use of own or hired car recommended. Private chauffeur driven car service available for excursions and airport and train station transfers. Cost of transfer (per trip, not p.p.) from Jerez/Seville airports 75 euros + VAT. Plenty of free parking available. SEVILLE airport: 62 km/55 min. JEREZ airport: 36 km/37 min. GIBRALTAR airport: 154 km/1 h 48 min. MALAGA airport: 221 km/2 h 41 min. FARO airport (Portugal): 2 h 30 min. If you are flying from Gibraltar, allow 1 hr more to compensate for possible traffic holdups. Superbly organised excursions are part of the Hacienda experience. Tailor-made programme arranged on arrival, with maps, directions, parking, recommended restaurants, shops and half- or full-day private guides. Excursions to cities and towns: Seville, Jerez, Cadiz, Cordoba, Sanlucar de Barrameda, Vejer de la Frontera, Medina Sidonia. Theme excursions: the white villages, Costa de la Luz beaches, national parks and lakes. Visits: to an exclusive bull-breeding ranch, González-Byass sherry bodega, an authentic flamenco show, Yeguada de La Cartuja stud farm, the horse show at La Real Escuela Andaluza del Arte Ecuestre, birdwatching in Coto Doñana. Nearest: Restaurant El Andalus for dinner, the more informal Bistrot del Jardin for lunch, Cortijo Soto Real, Ctra. Villamartin, km. 13, Las Cabezas de San Juan. Spanish and international cuisine. The Hacienda provides a list of recommended restaurants.